Whether it's a finely tailored suit or a shirt from the "Big and Short" shop, custom clothing is the balls, so why not custom-order the things that allow you to see just how handsome all that other gear has made you? 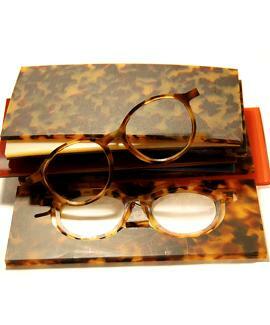 Have a vision for your vision, with Indivijual Custom Eyewear. Indivijual crafts bespoke acetate frames using internet and snail mail-gathered info on everything from skin tone and facial characteristics to personality and lifestyle, a plot hatched by an Abilene businessman and carried out with help from an architect, an engineer, and an art prof at Abilene Christian U -- one of the town's three religious colleges, so obviously, folks there see the light more clearly than most. Just lay down a refundable deposit, and you're sent a questionnaire asking for a galaxy of deets, some more plainly pertinent than others: from frame history/preferred colors/hair style to occupation/hobbies/car make & model; then, they'll mail you tools for skin-color analysis, mug measurements (face height/width, distance between pupils...), even a mold for your nose -- which hopefully won't later be used during a string of hilarious novelty-bespectacled bank robberies. Once all your info's in, several prelim designs are superimposed on your photo; upon approval, Indi uses proprietary tools to craft your frames from organic Italian plastic (made from wood & cotton), and installs precision hardware from Germany, which has a richer tradition of screwing people. Six to eight weeks later, you'll receive your frames; if you're not happy, send them back for a full refund, and use the cash on LASIK -- because what's more bespoke than someone customizing your 'balls?